« Physicians and Scientists know about the horrible effects of Mercury on human health…why don’t politicians and the MPCA? Our country is special because it is founded on the belief that government exists by, for, and of the people — all the people, not just the rich. I believe that my vote should count exactly the same as the vote of a rich person. I fear that our democracy is in grave danger if we allow special interests, with their legions of lobbyists and undisclosed funding of political candidates, to call the shots. I want to congratulate Fletcher on recently becoming a grandfather! Grandparenthood changes us. I know I want my grandkids to be able to enjoy canoe trips on pristine lakes, to be able to catch and eat a fish, to see the starry host in the dark northern sky. I do not want a grandchild to confront me, years from now, and ask why I didn’t do more to protect the BWCAW or put the brakes on global warming. The mining corporations can make all kinds of promises, but we all know that stuff happens: floods, explosions, human error, shortcuts to save money. In our water-rich environment, we know that water will eventually get to wherever we humans try to prevent it — and the result in this case will be damaging acid runoff. With a new Climate Change Study Group here in Ely, I’ve been reading Storms of My Grandchildren, by climate scientist James Hansen. Alongside good science and dire forecasts, the author tells many stories of how special interests have connived to discredit and silence scientists, manipulate politicians, and postpone any meaningful legislation to slow down human-caused climate change. In other words, the gas and coal CEOs are determined to keep enriching themselves and their stockholders, democracy and grandchildren be damned! Which is just what Fletcher would expect, but just what we the people cannot accept. There’s too much at stake now to resign ourselves to the way the rich (in Fletcher’s words) play their games. 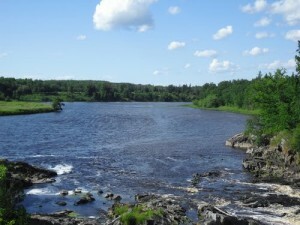 2 comments to Will you be able to tell your Grandchilden you did everything you could to protect the Lake Superior and Rainy River Watersheds? It is possible to defeat billionaire multinationals! Dryden, N.Y. did it…because they cared. Ely and people who know the true value of fresh unpolluted water can do the same. This is Dryden’s story. Let’s make in ours too. You remember Dryden, NY—the town that fought fracking? Well, they just keep on winning. Today, they did it again, in a big court victory against an oil and gas company that sued over the town’s fracking ban. You were an important part of this victory, sending a message of support to the people of Dryden while they awaited today’s decision. Two weeks ago, Dryden residents delivered your message—along with a map showing where each message came from—to their Town Board members. The Town Board members were incredibly grateful and have asked to keep your message, and 20,000 others, in an archive in the town library. We’ve got some tough battles ahead while communities across the country struggle to protect themselves from the consequences of the fracking-enabled oil and gas drilling boom. But today, take some time to celebrate your part in this victory.